Stubborn build ups on your fabric or vinyl convertible top can be quite the eyesore and detract from the car's beautiful appearance. 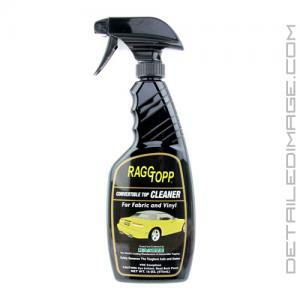 However you don't have to "just live with it" remove them safely and permanently with the Raggtopp Convertible Top Cleaner. This formula safely separates and lifts contaminants to the surface so they can easily be removed. Raggtopp is endorsed by Haartz and other major convertible top manufacturer's as the premier products for their tops. For a general cleaning you can mist it on the top just before washing your car. To treat stains spray the area directly and agitate with a microfiber towel or a soft to medium bristle brush. After one cleaning you can bring back shades of the convertible top that have not been seen in years. Contaminants can easily become lodged in the fibers or micro-ridges of the top so it's important to give them a thorough cleaning semi-regularly. 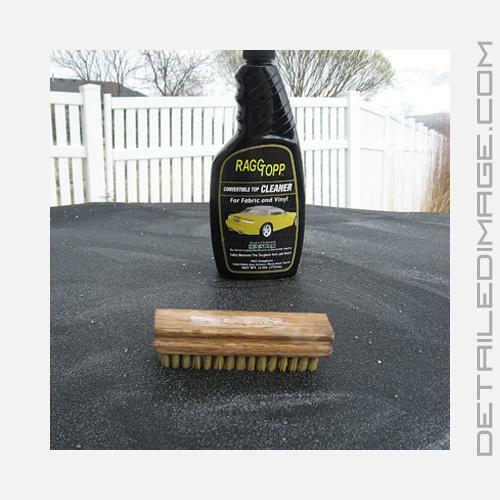 You can use this product on new tops and even very old tops. Environmentally Friendly. Non-Toxic. Biodegradable. Safe On All Surfaces. Removes Soils, Stains, and Some Mildew. DIRECTIONS: Rinse thoroughly to remove loose particle or debris. Apply evenly on wet surface and scrub lightly with a soft brush, terry cloth rag or sponge. Difficult stains let stand for 10-20 minutes before lightly scrubbing to loosen soil or stain. RINSE THOROUGHLY. Cleaning may be more difficult in cold climates below 54 degrees. Cleaning should be followed by manufactured approved RAGGTOPP Fabric Protectant or RAGGTOPP Vinyl Protectant if your convertible top is fabric or vinyl.